Scientists working in the Araguaia River basin of Brazil have discovered the first new river dolphin species in almost 100 years. Critically endangered, there may be only 1,000 of them left. River dolphins are distantly related to sea dolphins. They feature long beaks which they use to hunt for fish in the mud at the bottom of rivers. These specialized dolphins are among the world's rarest creatures; the IUCN says there are only four known species, with three of them appearing on the critically endangered list. The new breed, named Araguaian Boto (I. araguaiaensis), is now the fifth known river dolphin. The researchers say the species diverged from other South American river species more than two million years ago. Up until this point, the species was confused with a related one, I. boliviensis. Compared to other river dolphins, Araguaia have fewer teeth, a wider braincase, and they're a bit smaller. But to truly distinguish the species, the researchers had to perform a mitochondrial genetic analysis. The researchers are obviously concerned for these dolphins. At a population of approximately 1,033, and living along relatively small stretches of rivers, they're plagued by low genetic diversity and human pressures, such as agricultural and ranching activities (fishermen have been known to shoot them), and the construction of hydroelectric dams (which serves to isolate populations). 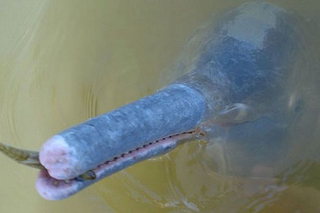 Read the entire study at PLoS: "A New Species of River Dolphin from Brazil or: How Little Do We Know Our Biodiversity."